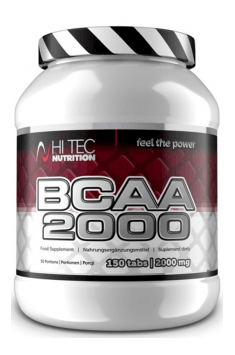 Hi Tec Nutrition BCAA 2000 is a dietary supplement with a huge dose of branched-chain amino acids (BCAAs). These amino acids are necessary for building muscle mass, help protect muscle fibres against catabolism and boost energy production in muscles. The product features B vitamins which are responsible for healthy energy metabolism and support the body during physical activity. BCAAs, i.e. branched-chain amino acids, are three indispensable amino acids which must be supplied in a diet because the body cannot synthesise them itself. BCAAs include L-leucine, L-isoleucine and L-valine which are in the supplement in the optimal ratio of 2:1:1. These amino acids account for ¼ of the amino acids in skeletal muscles, which means that they are extremely important for their normal function. L-Leucine – an amino acid which is the most effective in stimulating the synthesis of new muscle proteins (MPS) and thus makes it easier to gain lean body mass. L-Leucine activates the mTOR kinase which speeds up MPS and promotes the growth of muscle fibres. Furthermore, this amino acids stimulates the activity of insulin, which helps supply nutrients to tissues, and promotes glucose uptake by skeletal muscles. Consequently, L-leucine aids in increasing the body’s physical performance and speeding up post-workout recovery. L-Isoleucine – an isomer of the aforementioned amino acid which stimulates also mTOR kinase activity. However, it has slightly weaker effects. L-Isoleucine stimulates glucose uptake by muscle tissue and its mechanism of action seems to be independent of insulin. Anticatabolic properties of this amino acid are associated also with inhibition of gluconeogenesis which promotes the breakdown of muscle tissue to obtain energy. L-Valine – like two other amino acids, it encourages muscle glycogen synthesis and stimulates insulin activity. It improves tissue regeneration and reduces training-induced muscle damage and delayed onset muscle soreness. What is more, since it has an impact on the nervous system, it helps maintain adequate levels of focus and motivation during training, delay fatigue and improve reaction time. Even though each of three branched-chain amino acids has slightly different properties, all of them contribute to improving athletic performance and promoting recovery and anabolism. Amino acids inhibit muscle tissue breakdown during long exercises, stimulate fatty acid oxidation and may increase oxygen utilisation, thereby helping you do your training session. Vitamin B3 – increases the release of fatty acids from adipocytes to utilise them as a source of energy. In addition, it is necessary for the production of nicotinamide adenine dinucletodide (NADH) which is involved in processes of cellular respiration and energy production. Vitamin B5 – is required for the synthesis of coenzyme (CoA) which participates in fatty acid metabolism. Furthermore, it is involved in the synthesis of lipids and neurotransmitters and is thus critical to healthy nervous system function. Vitamin B6 – is a prerequisite to normal course of enzymatic reactions and necessary for neurotransmitter production and normal functioning of the nervous system. What is more, the vitamin may stimulate growth hormone production in response to strength training and encourages fatty acid release from adipocytes, thereby helping improve body composition. Vitamin B12 – takes part in the synthesis of haemoglobin – the red blood pigment which is responsible for oxygen transport in the body. This vitamin is responsible for healthy function of the brain and nervous system by, among others, stimulating nerve cell growth and inhibiting axonal apoptosis. To sum up, Hi Tec Nutrition BCAA 2000 is a dietary supplement with a high dose of branched-chain amino acids, enriched with B vitamins. The product stimulates energy production processes in the body and helps improve the body’s fitness. It has also anabolic and anticatabolic properties which will help maintain the desired body composition during long exercises. Great product. I use it before and it was really great ! Take 3 tablets (portion) 3 times a day: in the morning on an empty stomach, 20 minutes before training, immediately after training. Take 3 tablets (portion) 2-3 times a day: in the morning on an empty stomach, 1-2 times a day during the day between meals. In order to support the function of muscles and protect them against breakdown, the formulation may be taken before and during training. The product is recommended to individuals doing long-term endurance training or strength training. In order to enhance the body’s training performance, the supplement may be taken with stimulants. The product should be stored in a dry and cold place. Whey protein isolate, anti-caking agent: magnesium salts of fatty acids. The product may contain milk, soy, eggs, gluten. A pre-workout supplement maximizing exercise capacity enclosed in the form of a comfortable single-use shot.